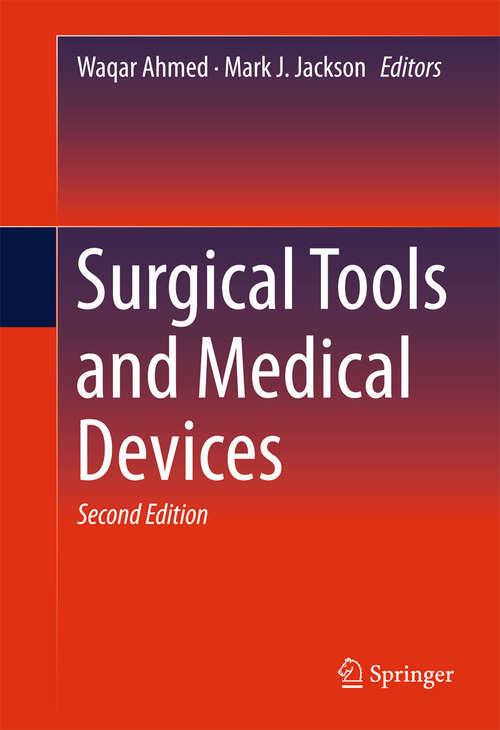 This new edition presents information and knowledge on the field of biomedical devices and surgical tools. The authors look at the interactions between nanotechnology, nanomaterials, design, modeling, and tools for surgical and dental applications, as well as how nanostructured surfaces can be created for the purposes of improving cell adhesion between medical devices and the human body. Each original chapter is revised in this second edition and describes developments in coatings for heart valves, stents, hip and knee joints, cardiovascular devices, orthodontic applications, and regenerative materials such as bone substitutes. There are also 8 new chapters that address: Microvascular anastomoses Inhaler devices used for pulmonary delivery of medical aerosols Surface modification of interference screws Biomechanics of the mandible (a detailed case study) Safety and medical devices The synthesis of nanostructured material Delivery of anticancer molecules using carbon nanotubes Nano and micro coatings for medical devices This book is appropriate for engineers, material scientists, chemists, physicists, biologists, medical and dental professionals with an interest in biomedical devices and tools, and researchers in the same fields.